Taking a young child around can be a challenge for a lot of parents. However, baby gear can make moving about with a young child much easier, which is why it is considered essential by many. Strollers are just some of the most important equipment for a lot of households, as they allow parents to move unencumbered, letting them perform tasks and errands without too much fuss. Taking your child with you to your daily activities doesn’t have to be a major undertaking. With the best all-terrain strollers, you can move around on different surfaces without a hitch while ensuring your baby’s safety and comfort. A great choice for parents who love the outdoors, these strollers will really let you move around with great ease, without compromising your little one’s well-being. If you’re interested in getting the most reliable all-terrain stroller for your little one, here are a few top options that you should check out. Versatility is one of the things people look for when they decide to get an all-terrain stroller. While these pushchairs are already versatile enough with the wide capabilities of their wheels, it won’t hurt if the unit itself can offer more. This is why the Jane Trider Extreme has made it to our list. It offers large, solid rubber wheels that promise not to get flat or need some air, along with the ability to roll over all kinds of terrain, from solid concrete to grass, rocks, and even sand. It also features all-wheel suspension, an easy folding mechanism, a rain cover, a hand-controlled parking brake, and even a foldable soft fabric bassinet for infants. What's Great About It: What makes the Extreme versatile is its reversible seats. With just a little push and pull, you can reconfigure the entire unit into a front- or back-facing stroller. This makes it a solid option for parents who want to keep a close eye on their little ones, but also want to give them the choice of seeing their surroundings while out and about from time to time. For families who can’t wait to go on fun outdoor adventures with their little ones, having the best all-terrain stroller is a must. The stable construction, comfortable suspension, and powerful traction of these units make them ideal for traversing uneven paths, letting you explore nature while carting around your little one. Products like the BOB Sport Utility Stroller are actually made for this very purpose, so you don’t have to compromise or slow down your active outdoorsy lifestyle, even as you grow your little family. Easy to configure and packed with great features like an adjustable handlebar, push-button recline, a hand-activated caliper brake, and travel system-readiness, the BOB Sport Utility Stroller is definitely the companion that active parents need on their forays to the great outdoors. What's Great About It: Designed to take on trails with its large, knobby, air-filled front tire that is fixed in a single position, it offers the stability you need to keep your baby safe while rolling on uneven surfaces. All of its tires are on high-impact polymer, so it’s certainly ready to take on rough trails. Topped with a state-of-the-art adjustable suspension system, you can rest assured that your little one will stay comfortable during his ride. Manufactured by one of the global leaders in carriers, you’ll know that a stroller made by Thule will really deliver when it comes to your child’s safety and comfort. Because the brand is known for its toughness, you can count on it to provide an excellent ride for your little one, no matter what the terrain is like. 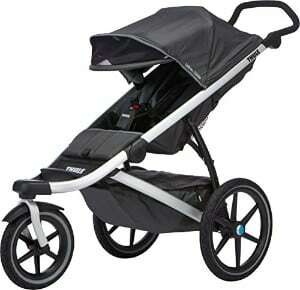 These are the very reasons why the Thule Urban Glide deserves a spot on my best all-terrain strollers list. While this item doesn’t have knobby tires, like the others on this list, it still does a fantastic job of handling rougher terrains, considering that it is made for city sidewalks. It can definitely tackle “urban trails” and rocky patches with great ease, so if you’re a city parent who likes to explore new routes, this could be the perfect choice for you. What's Great About It: Designed with the active parent in mind, the Thule Urban Glide is a jogging stroller that a lot of runners favor. It’s highly maneuverable with its lockable front wheels that are also large in size, making it perfect for runs around the block, park, or even minor trails. With its rear suspension, pneumatic tires, and padded seats, your child won’t complain about a bumpy ride, even if you take on rockier surfaces and faster runs. You can also count on it to be secure and durable, so you don’t have to worry about your little one’s safety at all. Training for a marathon is very challenging, especially if you have a child in tow. The first thing you need is the best jogging stroller to help ensure your baby’s comfort and safety. All-terrain wheels can also help make it even better, as that will allow you to train in more challenging surfaces without having to leave your baby at home. The Joovy Zoom 360 Ultralight has been a top choice for such a purpose by many parents, so if you’re in the market for a good unit that you can take on challenging runs, this might just be the best pick for you. 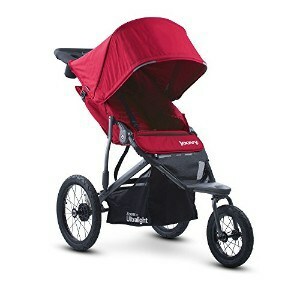 With lots of storage, a high weight capacity, a quick-fold design, and the Joovy signature over-sized canopy, you can bet that this product has everything you need in an all-terrain jogger and more. It even comes with a tire pump, which is a really handy extra, so you can always ensure that your stroller is in perfect shape right before you take it out of the house. What's Great About It: The best thing about the Zoom 360 Ultralight, according to users, is its comfort. With its shock-absorbing suspension system and ergonomic design, neither parent nor baby will have a hard time using it. Your child is promised a smooth ride, and you won’t have to spend all of your energy trying to control and maneuver the unit, as it’s very easy to handle and manipulate. Being on a tight budget doesn’t mean that you have to compromise on the baby gear you get. You will need to be extra resourceful and patient when shopping, however, as not a lot of all-terrain strollers come with a friendly price tag like the Baby Trend Xcel Jogger Stroller. 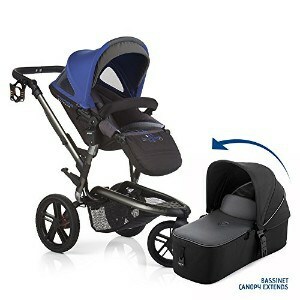 Despite its low price, it can still do a great job in helping you keep your baby safe and comfortable on your outings. Featuring large pneumatic bicycle tires, a foot-activated brake, locking front wheels, reclining padded seats, an over-sized canopy, storage options, and a compact folding design, this product can certainly keep up with more expensive models. Top it all off with a very affordable price, and you've got yourself a very practical option. What's Great About It: What might convince you to opt for this product is its safety features. Aside from its stability and 5-point harness, it’s also JPMA (Juvenile Products Manufacturers Association)-certified. This means that it has passed several testing and set safety standards, guaranteeing that it’s very safe for your child’s use. Confused with all of the great options you have? 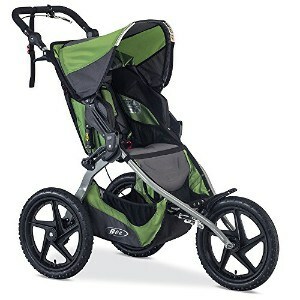 Choosing an all-terrain stroller can really be a challenge, as there are tons of fantastic units out there. So, to help you make a choice, here are a few important notes that you need to know if you want to bring home the best all-terrain pushchair for your baby. Some people tend to assume that jogging strollers and all-terrain strollers are one and the same. This isn’t true, however. The two are independent of each other, although there are jogging strollers that are all-terrain strollers and vice-versa. More in Baby Strollers: What are the Best Sit and Stand Strollers? The wheels of all-terrain strollers set them apart from other kinds of pushchairs for kids, so you have to be very particular about them. Experts prefer larger, air-filled wheels so they can provide better suspension and ensure your baby’s comfort despite having to roll on uneven surfaces. Treads are also important to ensure your little one’s safety, because they determine the amount of traction you get. You’ll also want to look for front wheels that swivel and lock for better maneuverability. All of these can help guarantee your baby’s comfort and safety, so you should absolutely pay close attention to these components while shopping for the best unit. More in Strollers: What are the Best Umbrella Strollers to Buy? While the best all-terrain strollers are designed to ensure your little one’s safety, that doesn’t mean that your little one won’t be put at risk when riding them. There are tons of risks that you wouldn’t want your child to be exposed to, so getting to know the risks and being very observant will help you go a long way in preventing these dangers from harming your little one. It’s best to just not take young kids on really difficult and rocky terrains, especially hilly ones, so you won’t subject your child to rolling off. You’ll also want to make sure that you have full control of the stroller before taking them out on an uneven surface, so you won’t risk losing control of the unit, which can lead to falls and injuries. More in Strollers: What are the Best Stroller Fans? If you intend to roll on uneven surfaces, you should make sure that the stroller offers great stability. This can guarantee that you’ll have ample control of the unit, minimizing the dangers that your little one might face. As mentioned above, there are certain risks your child might face if you take them on a challenging surface. The best all-terrain stroller will help out in keeping your child in perfect shape, so you have to make sure that it’s equipped with many safety features. 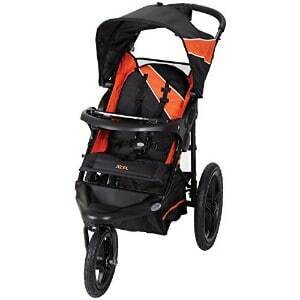 Most all-terrain strollers are quite hefty, as they have additional features that are designed to provide comfort. This is why the first concern about these products is maneuverability. You’ll need it to be highly maneuverable to give you more control and help guarantee your child’s safety while you’re on a trail or a rough terrain. Bumpy rides can damage regular strollers, so all-terrain units need to be sturdier and more durable. The wheels can’t be flimsy, as the weight of your child and a rocky surface can definitely dislodge them and cause a fall. You don’t want any of these things to happen, so you have to be very particular about quality. As the most precious thing to you will be the one who’s going to ride this stroller, you’ll naturally want to make sure that they’ll be comfortable on your outings. All-terrain strollers with suspension and even anti-shock properties are great options to ensure that your little one won’t be shaken to the core if you need to go through an uneven surface. Taking your kids on outdoor adventures, even if it’s just to the park or an easy local trail, can spark their love and interest in the outdoors. The best all-terrain stroller can help you accomplish that with great ease. You just need to find the best match for your little one’s safety and convenience. I hope my picks get to help you at least narrow down your options so you can go out to see the great outdoors with your little one in tow.